According to Holger Stark, it was clear that Snowden had sorted the documents, not very fine-grained, but he had put them in a few folders, according to topics that had his special interest, like operations of the NSA divisions TAO (hacking) and SSO (cable tapping). Rosenberg said that it looked like Snowden selected the documents based upon his concerns regarding civil liberties and that he did not do some "collect it all" scraping. The journalists tried to search and filter the documents automatically, but a huge number of them had to be read and analysed manually, and read over and over again, in order to understand what was in them and what their importance could be. For that, they also consulted experts for cryptography and network architecture as well as former NSA employees like Binney and Drake (independent intelligence experts were not mentioned). It was possible to ask Snowden, but not in a regular or easy way, also because he wanted to stay at a distance of the journalistic work. The journalists couldn't tell or estimate how many documents Snowden actually took. 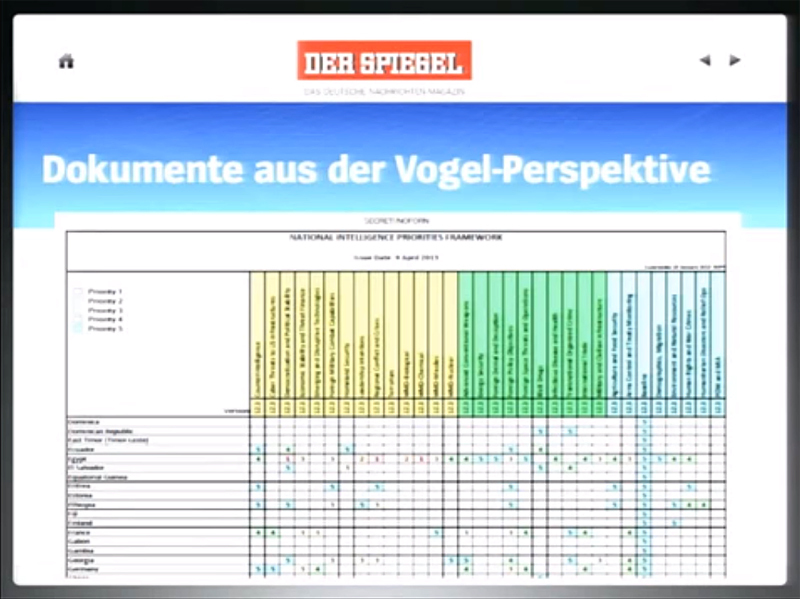 Der Spiegel got the documents unredacted but in the documents that were published, editors redacted most of the names. Der Spiegel frequently asked NSA to review the documents they wanted to publish, in order to prevent that lives could become in danger. Sometimes NSA asked to remove things, but when it was obvious that that was for political reasons, the request was ignored. But in a few other cases Der Spiegel didn't publish or partly redacted the documents. Despite all their efforts, there were still many gaps and questions. This resulted in for example a wrong interpretation of NSA's data visualisation tool BOUNDLESSINFORMANT. In August 2013, Der Spiegel published charts from this tool that were initially interpreted as showing how many data NSA collected from several European countries. Soon, BND and NSA denied this and explained that the charts show data that European agencies provided to the Americans. Holger Stark admitted that their initial interpretation was apparently not correct, but that there are still many questions about this issue. One of the difficulties was that NSA and US government were not willing to respond to questions about this program, so they decided to publish their best guess. Rosenbach added that major foreign papers also shared their initial interpretation (maybe because the wrong interpretation came from Greenwald?). The NIPF consists of a large matrix with each cell indicating the intersection between a state or non-state actor and an intelligence topic. A readable reconstruction of the NIPF based upon this new piece and earlier sources, can be found here (pdf). This newsletter says that updated versions of the NIPF are released about twice a year, and that these are run against the National SIGINT Requirements Process (NSRP), which sets the priorities for acquiring Signals Intelligence (SIGINT). The 5 levels of NIPF priorities are then translated (by the SIGINT Committee or SIGCOM) to the 9 levels of SIGINT priorities, based upon the importance of the SIGINT contribution. The first NIPF was issued in 2003 and at that time the matrix contained over 2300 cells! There were hundreds of issues with priority 1 and 2, way too many to be managable. So over the years the number of priorities, particularly the numbers of priority 1s and 2s had been reduced. According to the journalists, the newsletter also explains that topics with priority 1 and 2 are meant for the president and the White House, while priority 3 is for cabinet ministers, the Chiefs of Staff and the Pentagon. For these highest priorities, covert intelligence methods are used. For priorities 4 and 5 open sources may be sufficient and their results are mainly used for political analysis. For the Spiegel journalists this bureaucratic process illustrates that NSA isn't an agency that went rogue, but that they are directed by the political information needs from the White House (something that was usually conveniently ignored). Svea Eckert, a documentary maker for the regional German broadcasster NDR, was also present at the interview, and she had brought with her the laptop they had used for working with the Snowden documents. The computer was newly bought for this purpose and was never connected to the internet. 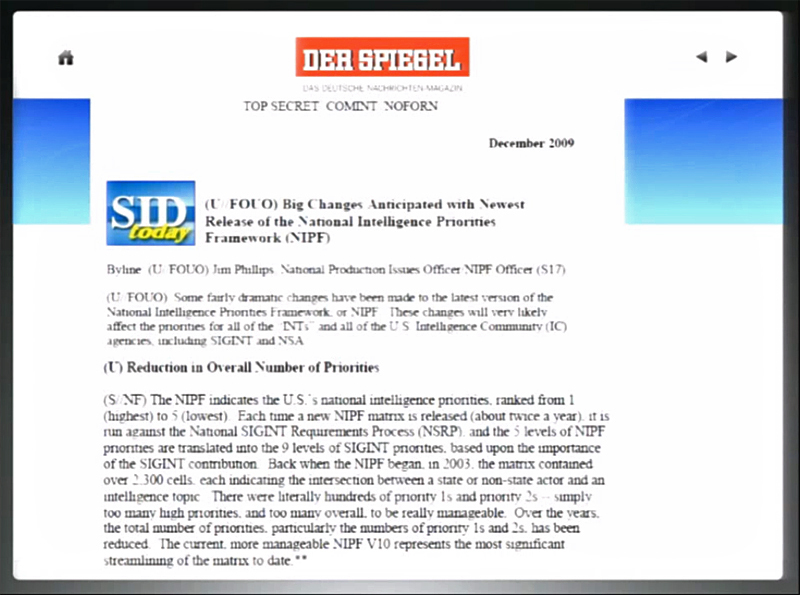 At NDR, Eckert was doing research for a documentary about the internet as a battle space, when a colleague of her in the US was provided with a thumb drive containing Snowden documents that had been selected on their relevance for the topic of the documentary. It wasn't told who the middlemen for these documents were, and apparently different German news media got documents from different sources. In the window we see for example an internal NSA newsletter with an interview with a hacker from NSA's TAO division, a Cyber Warfare Lexicon and a powerpoint presentation. 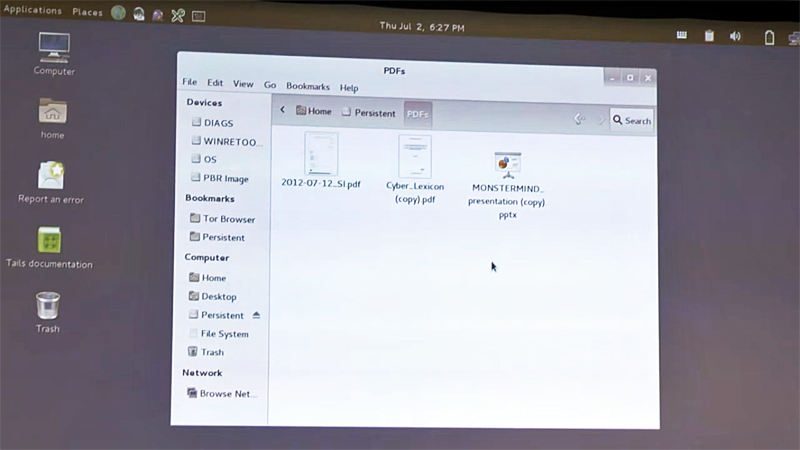 The latter has the filename "MONSTERMIND_presentation (copy).pptx", but when it was opened, it actually had the cover term CYBERCOP on the front slide and it was prepared by the "CyberCOP Product Manager". Eckert explained that although most of these documents were very interesting, not everything was newsworthy enough or in the public interest to publish. Also the opinions of various experts had to be asked, because journalists were not always able to judge what the context or the importance of particular pieces of information was. 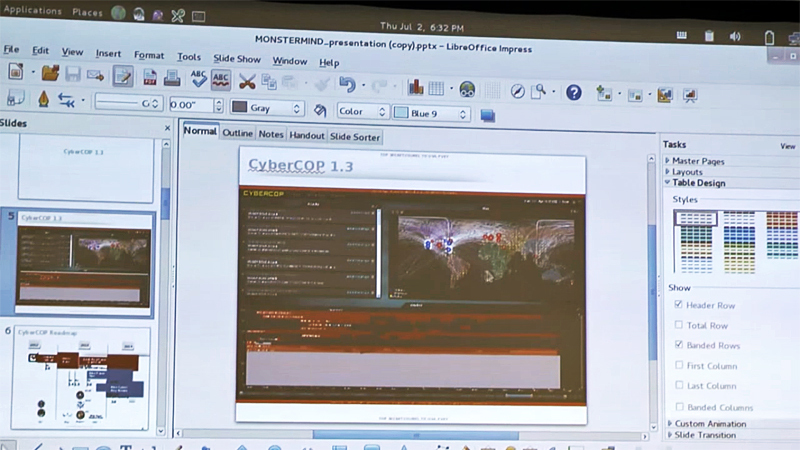 It was decided not to publish the full MONSTERMIND/CYBERCOP presentation, but the documentary Schlachtfeld Internet ("Battlefield Internet") did contain several slides, which showed that NSA is apparently powerful enough to trace such attacks and that therefore the agency must be present at numerous points on the internet. This was considered newsworthy enough to report about. 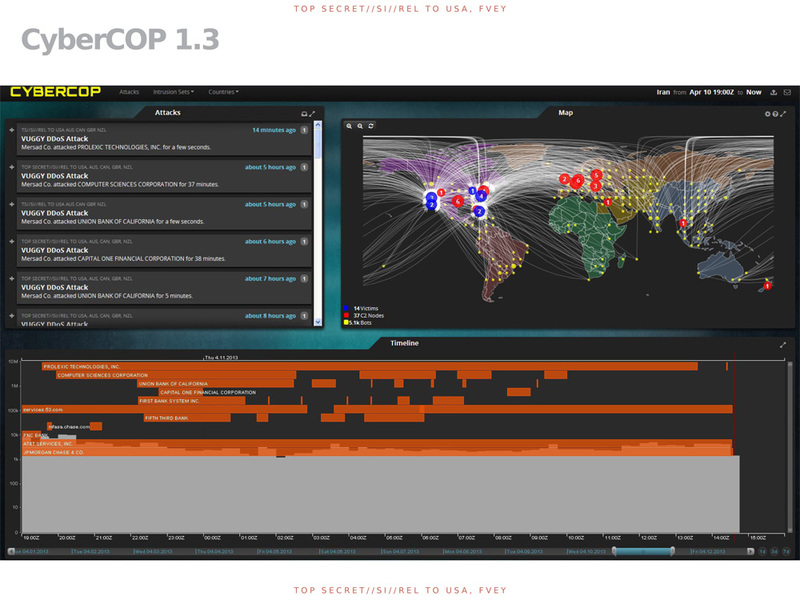 In the documentary itself it was explained that an analysis tool called CYBERCOP makes it possible for NSA to monitor "cyber war" in real time. The presentation described at least one specific attack: on April 10, 2012, the US federal banking system in New York was succesfully attacked by Iran, not directly, but through thousands of computers around the world, controlled through internet servers in Germany. The MONSTERMIND system was first disclosed in a very long interview that James Bamford had with Edward Snowden in August 2014. There, Snowden said that MONSTERMIND is a frightening program that automated "the process of hunting for the beginnings of a foreign cyberattack". The "killing" capability was also described in Eckert's documentary, but without mentioning the codename MONSTERMIND. It didn't became clear whether this just came from Snowden's recollection or that it's mentioned in the CYBERCOP presentation (or other documents). The journalists from Der Spiegel also found interesting things purely by accident. The cache of documents for example contained an NSA presentation from the Center for Content Extraction (CCE, unit designator T1221) about a system to automatically sort out interesting and useful parts of intercepted phone calls. Der Spiegel published this slide on March 29, 2014 and the full presentation (pdf) was released online in June 2014. That chancellor Merkel had been a target of NSA had already been revealed in October 2013, based upon a database entry that allegedly did not came from the Snowden documents, but from another and yet unidentified second source. 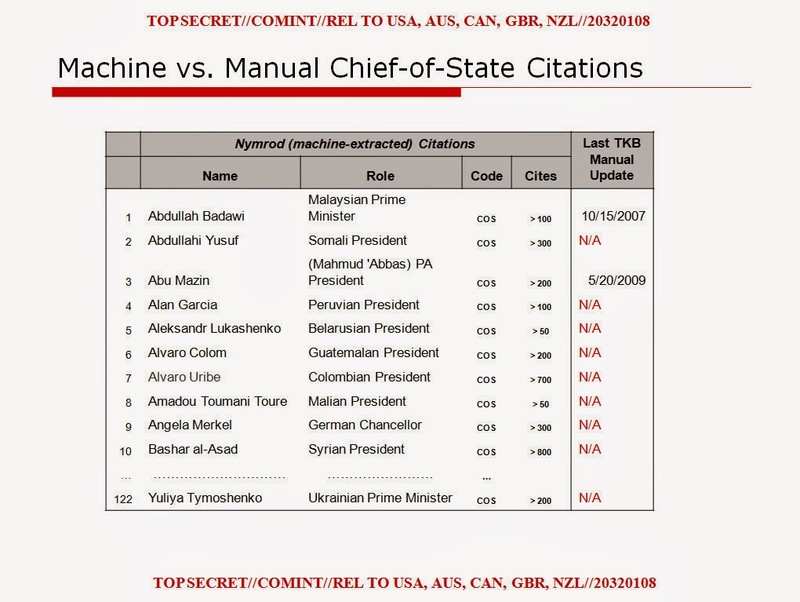 So far, it seems that this example from the chiefs-of-state list is the only confirmation of NSA's targeting of chancellor Merkel that came from the Snowden documents. The intercepted content published by Wikileaks is also supposed to be from the second source. - Contrary to some claims made by the US government, there seemed to be little danger that these documents could endanger the lives of operatives or other people. The work that NSA does is highly technical and therefore the documents hardly contain any names. Most of the names they do contain are of authors, not of operative field agents. - Eckert found it disappointing that the documents had almost no code or malware signatures in them, which could have been useful to identify hacking operations conducted by the NSA (Eckert said the XKEYSCORE rules were not included in the set she received). Again this was because the documents were often for management and training purposes and contained information on a meta level instead of actual operational details. - The journalists were aware of the fact that these presentations had to be judged according to their intended purpose and audience and that the audio of these presentations was of course absent, although some presentations came with speaker's notes, which proved to be useful. Important was also to that presentations will often have presented things in a positive way. Finally, when asked about the future of the Snowden documents, the journalists thought that it could be good to make them available for scientific research, but that it's not up to them to decide. They were not in favor of making all the documents publicly available, like in the way Wikileaks used to do.